There's nothing quite like sitting on a bungalow porch and watching the world go by. 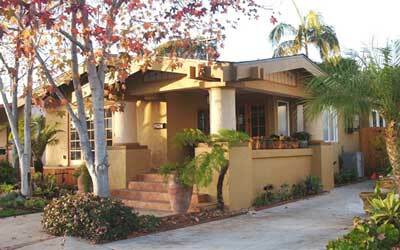 Also known as Arts and Crafts bungalows, many bungalow style homes are based on the American Arts and Crafts movement. The most exciting feature for us of course, is a front porch beneath an extension of the main roof. 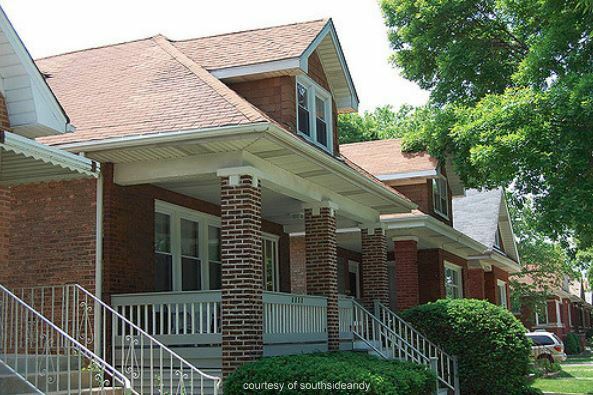 Did you know that Chicago is home to more bungalows than any other single building type? It's estimated the city has approximately 80,000 bungalows just within the city limits. That's nearly one-third of their single-family homes. Note that no matter the style of bungalow, they have one important feature in common - the bungalow porch. Because of the nature of design, the bungalow porch creates a sense of community. You will find that most bungalows are built in specific sections of a town or city. Their owners would sit on the porch after a hard days work to rest and talk with neighbors and friends. Bungalows have great porches. The American Craftsman bungalow typified the common styles of the American Arts and Crafts movement, with common features to include low-pitch roof lines on a gabled or hipped roof; deeply overhanging eaves; exposed rafters or decorative brackets under the eaves; and a front porch beneath an extension of the main roof. Chicago Bungalows are typically built of brick and have one and a half stories. The primary difference between a Chicago bungalow and others is that the roof gables are parallel rather than perpendicular to the street. Chicago bungalows are relatively narrow, an average of only 20 feet wide. 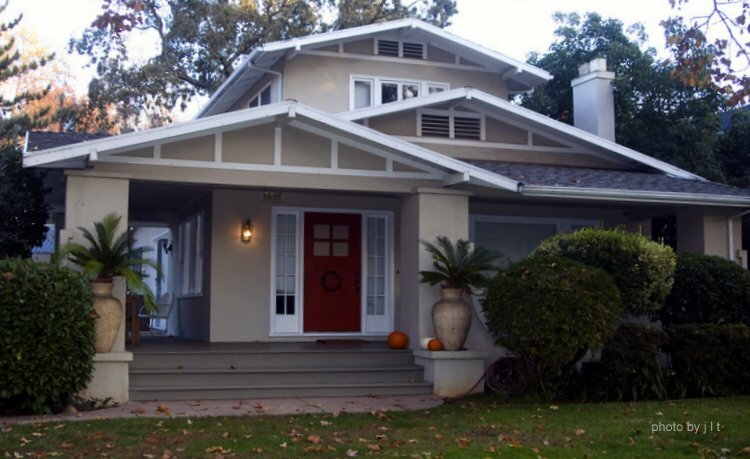 The California Bungalow was a widely popular 1 1/2 story variation on the bungalow in America from 1910 to 1925. Milwaukee Bungalows: Many older houses in Milwaukee, Wisconsin, are bungalows similar to those of the Arts and Crafts style like Chicago's, but usually with the roof gables perpendicular to the street. 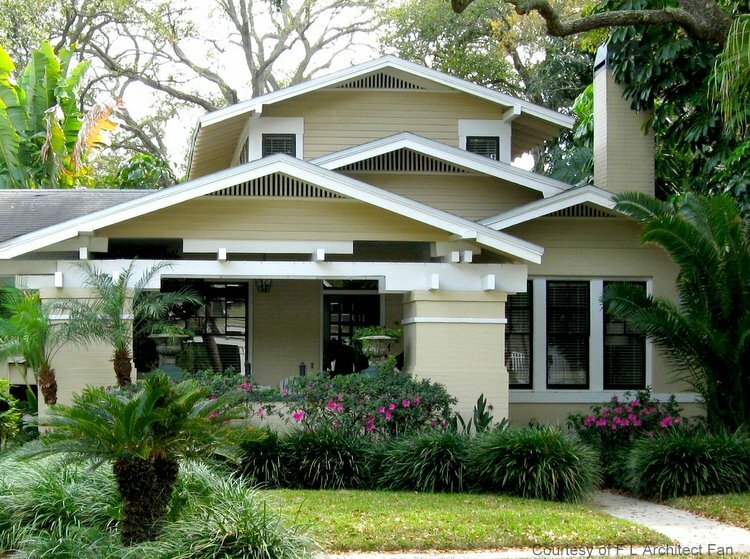 Milwaukee bungalows tend to have white stucco on the lower portion of the exterior. Detroit Bungalows: Also built during the Arts and Crafts movement, Detroit bungalows were constructed using local building materials. Ranch Bungalows: Ranch bungalows are designed with bedrooms on one side and the living areas on the other. The attached garage, if present, is located on the living area side. Raised bungalows: Raised bungalows have a basement that is partially above ground allowing for natural lighting in the lower level. Foyers are usually located at ground level half-way between the floors. Garage entrances are normally at basement level. Airplane Bungalows: Variations of craftsman style home plans include the "Airplane" bungalow which has a much smaller area on its second floor that appears to "pop out". Centered on the structure with windows on all sides it has a view much like that of a cockpit of an airplane. 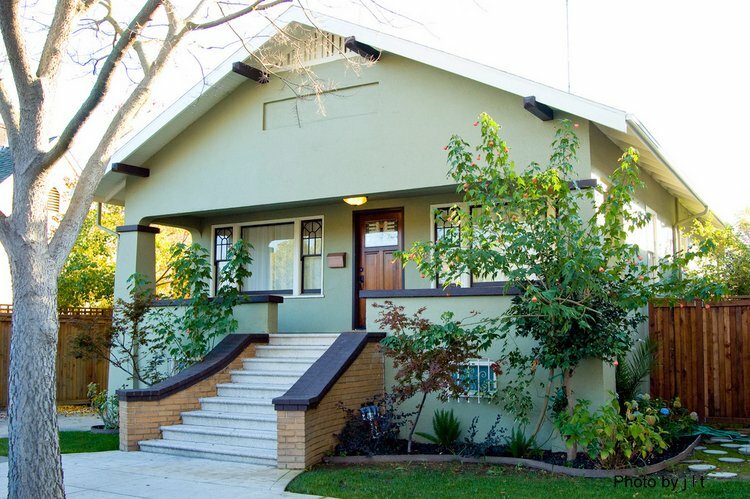 An LA company introduced a Japanese-pagoda roof-line inspired style at one time and called it an "aeroplane bungalow." You might note that bungalows do not have attics. This allows for the distinctive roof line which is normally quite low. Natural materials like wooden shingles and clapboard are used for siding. Cobblestones and brick are normally used for the exterior walls, porch columns and chimneys. 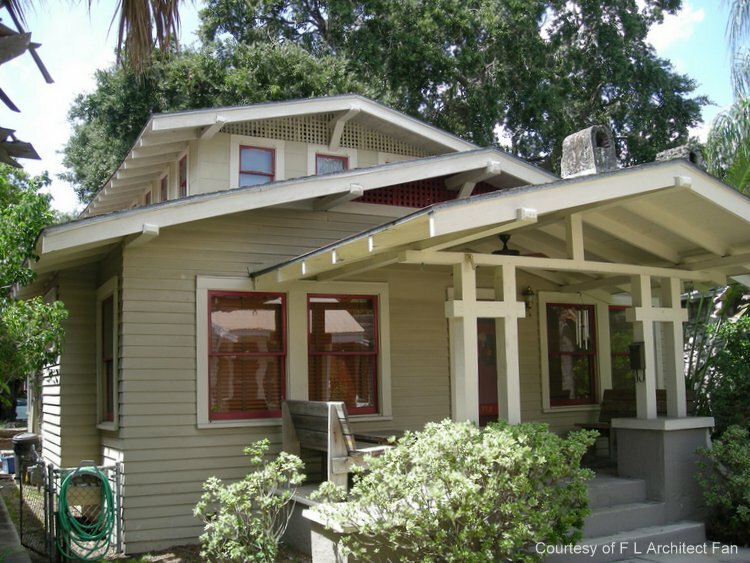 See this wonderfully designed Craftsman front porch; great ideas for your porch too!